Kantar Worldpanel1, the global market leader in consumer panels, reports 5.1% value growth for the FMCG (Fast Moving Consumer Goods) market for the latest 52 weeks up to Oct 3rd, 2014. China market has entered a stage where brand sales growth is heavily reliant on market share increase and attracting more consumers has become the key imperative for market share growth. The recent study from Kantar Worldpanel also finds that, in urban China’s FMCG market, the majority of the companies reaching more than 100 million households are suffering a deceleration of consumer recruitment. As many categories experienced growth challenges in China, winning more new consumers will be the most important success factors for FMCG companies in the coming 3-5 years. Among the food companies, Master Kong2, Nestle and Yili still make up the top three in terms of consumer base, reaching 141 million, 138 million and 137 million households respectively. Yili has been the strongest in expanding its buyer base among the three, gaining 2.8 million more households in the past 12 months. Among all major food companies, Fujian Dali Group and Mars (including Wrigley China) enjoyed the highest growth in attracting new buyers. P&G still lead in consumer base in the non-food sector. Thanks to its multi-brand strategy, the brands in the P&G family were purchased by 151 million urban Chinese families in the last 12 months. On the other hand, Nice Group and Unilever are growing rapidly in gaining new consumers. Nice’ growth was largely contributed by its laundry liquid; while Unilever attracts new buyers with its laundry liquid, fabric softener and body wash brands. Kantar Worldpanel suggests that the key to the successful expansion of consumer base is to drive more growth in lower tier cities3, to enter emerging categories and to introduce new innovations meeting the nascent consumer needs. With market saturation in the top tier cities, most companies with over 100 million households have generally gained more buyers from low tier cities. Kantar Worldpanel’s analysis indicates that low-tier-city consumers make up 80% of new buyers for the top companies. For instance, 84% of the 3 million new households newly acquired by Mars Group in the past year came from low tier cities. Hence it is critical to win in the new tier cities if companies want to attract more new consumers. Among all companies reaching over 100 million urban families, Nice Group recorded the highest consumer base increase over the past 12 months, growing its penetration by 4.1%. Its success could be attributed to not only its expansion in low tier cities, but also its focus on the emerging categories. While the overall FMCG market slows down, laundry liquid, as a developing category, still enjoys double digit growth and buyer base expansion. Nice Group has gained 10 million new urban families in the past year through its core product Supra laundry liquid, with its two-season “supra women” marketing campaigns both online and offline. Companies who could successfully recruit buyers are usually those who can rapidly adapt to the changing purchase and consumption behavior. In China, the pursuit of a healthy, high quality lifestyle has now become the key for market development. Categories with distinctive health benefits, like ambient yogurt, Lactobacillus drinks and protein drinks, are growing strongly despite the overall slowdown in retail sales. Yili launched its Ambrosial UHT Greek yogurt at the end of 2014 to capitalize the growing appetite for healthy product. Kantar Worldpanel report reveals that Ambrosial has attracted 2.4 million urban families 36 weeks since its launch. Another case in point is Lux, a brand under Unilever. It re-launched its “fine fragrance” body wash line to meet consumer needs for long lasting scents, gaining 1.2 million new buying families. 1. 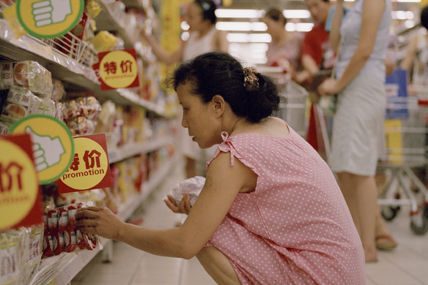 Kantar Worldpanel China continuously tracks more than 100 categories of household purchase including make-up, Food/Beverage and cleaning products. Its sample covers 20 provinces and 4 municipality city (Beijing, Tianjin, Shanghai and Chengdu). 2. The data of Master Kong only includes its beverage series, while not include the bottled products co-produced by Master Kong and Pepsi. 3. Low tier cities: Prefecture level cities, county-level cities and counties covered by Kantar Worldpanel research.